Whether you want to build a news feed like Twitter, Instagram, Spotify or Facebook we have you covered. 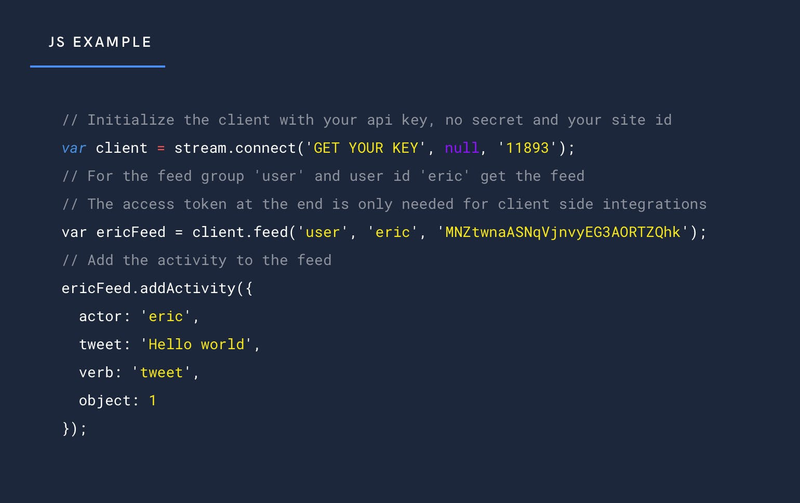 Stream's API enables you to build, scale and personalization your news feeds and activity streams. Laravel Aggregated Feeds, Ranked Feeds, feed specific analytics and personalization all help you improve your app's engagement, retention and conversion. Get started today building your Social network that has personalized feeds with Stream and Laravel! Laravel is considered one of the top frameworks for PHP and has a passionate developer community. It makes a fair claim as “The PHP Framework For Web Artisans”. The initial motivation for the framework was to develop a more advanced and feature-rich alternative to Code Igniter. The framework and community really hit stride in early 2012 with the v3 release. There are several features and official packages that make Laravel stand out from other frameworks. Homestead is a vagrant based development platform known that includes everything from an Ubuntu virtual machine up to a Gulp build toolchain. Socialite is a handy built-in component for authentication and OAuth providers. For virtually everything else there is the thousands of plugins that are easily integrated thanks to Laravel’s strong support for Composer. With a well considered code-base and so many great features to build upon, it is no wonder that Laravel is a popular way to build social networks and rich, dynamic applications. Our framework integration for Laravel is stream-laravel. The Client API project features a comprehensive phpunit unit test suite and stable Composer packages are published to the Packagist repository. Contributions in the form of issues, feature suggestions and pull requests are most welcome. Our low level PHP API is also available. mail_outlineContact us if you're using with Laravel and want to be featured.